In 1970s New York, the city’s wild nightlife, particularly Andy Warhol’s Studio 54, sparked a sexual revolution. Immersed in the creative world’s newly found sexual liberation, the pop-art master was inspired to create a series on NYC’s drag queens – and so Ladies and Gentlemen (1975-74) was born. The series features 10 screen prints of black and Hispanic drag queens who were scouted at a club called The Gilded Grape in Greenwich Village. A known obsessive of beauty, Warhol exacerbates the queens by dousing them in his signature pop art colours – this vividness reflecting the artist’s fascination for drag’s exaggeration of identity. While it is one of Warhol’s largest bodies of works, it has remained largely unknown from common knowledge – until now. The resurgence of Ladies and Gentlemen not only lends itself to a shift in the landscape of art as it angles more closely to queer experiences of colour, but also to New York-based painter Devan Shimoyama whose works are such a powerful recognition of the queer black experience, they inspired The Andy Warhol Museum in Pittsburgh to reshow the series. 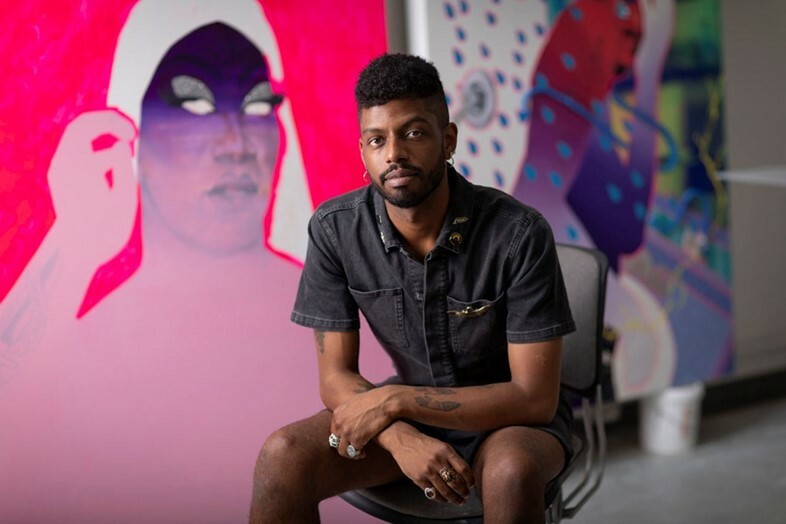 In the museum’s upcoming show, Devan Shimoyama: Cry Baby, Ladies and Gentlemen, Warhol’s series will go on display alongside a body of paintings by Shimoyama, which star Miami’s drag queens of today. It is also Shimoyama’s first solo show, and therefore the exhibition will display works from across his career. Shimoyama’s work is a utopian oasis where glitter, rhinestones, sequins, and block rainbow colours are in dialogue with topics as the raw realities of police brutality, black masculinity, and the importance of safe spaces. As a queer artist of colour, Shimoyama draws on his experiences to change the conversation around queer people of colour. Within his use of materials and bold palette, we see the importance of creating positive visual rhetoric around queer issues of colour, making his work the antidote to the endless visual stigmatisation of queer and black people in the media. In celebration of the launch of Devan Shimoyama: Cry Baby, we speak to the artist on the power of glitter and the parallels of his and Warhol’s paintings. Your works are so bright, they illicit happiness even when dealing with raw topics. Why do you think positive visual rhetoric is important in art when you're addressing really heavy issues? Devan Shimoyama: Positivity and happiness are how people can navigate the world and deal with issues day to day. Childish Gambino's music video for “This is America” is a key example of the power of positivity. It visualises the experience of being black in America. A lot of these dance crazes are coming out of places of pain as coping mechanisms. Creating this illusion of grandeur and beauty creates fun, light-hearted moments as a way to cope with darkness. Often beauty and happiness, and dancing and joy come from places of pain – to help make dark situations bearable. This translates through my use of jewellery, glitter, sequins, fabrics. Looking at yourself and looking at the materials, what’s the power of using mythology and magic instead of using reality in your work? 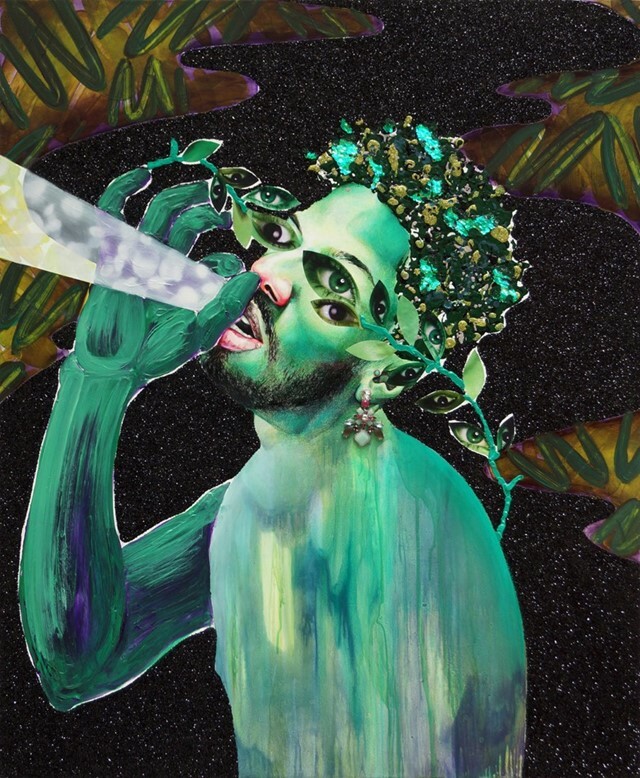 Devan Shimoyama: I use mythological and visual cues to allude to the queer, black, male experience. There are not many examples of those bodies in the media, so I’m creating my own fiction and magic to rectify that. When I was growing up, the examples I had of black queerness were comical or really extreme. I remember seeing a Ru Paul show, and that was a really specific lens which is only one example of black, queer masculinity. The other examples were for comedic effect. I remember looking at the character of Sheneneh that Martin Lawrence would do. It was his version of drag. It was comical but kind of bordering on insensitive at times. Other people would do something similar, like Eddie Murphy. Even looking at how queerness presented itself in other nuanced ways was fascinating, but then it wasn’t identified or labelled as that. Look at Prince, he used a lot of visually queer language and symbolism but didn’t identity as queer. It was really complicated witnessing these identities that were just appropriated for other purposes. Why do you think it's important you can use your art to reclaim spaces that have been dominated by traditional ideas of mascuilinity? Devan Shimoyama: I'm constructing a fantasy of a space indicative of the experience of getting a haircut as a certain individual and feeling the need to be completely mute and silent while receiving that haircut, so not to expose too much information about oneself in that space. I wanted to create that sort of sensation of disassociation so that the work became a call out to other people who identify similarly with those types of moments. So many queer individuals, men, women, and all that in-between have told me that they have had similar experiences. In this sense, I felt like I was almost cultivating a community of people who relate to an experience collectively. It’s a call to arms to bring people together to cultivate new spaces of possibility. There's certain programming surrounding this exhibition that I think speaks to some of those complex issues of blackness, queerness, and gender, where those things all intersect which I think can spark a huge dialogue. When we start talking about things and pointing out these issues, we can start to find ways together to resolve major issues. Do you have any of your works that are your favourite? 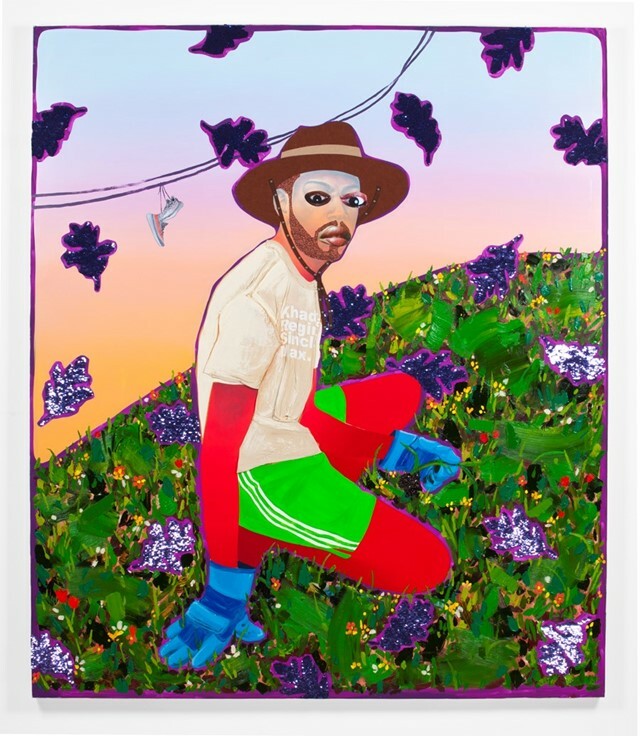 Devan Shimoyama: “Weed picker” is part of a new body of work on the idea of black ownership; people owning their own businesses, properties, and vehicles. I want to combat the gentrification of space that’s happening in black neighbourhoods. The importance of black ownership means you can cultivate your community and you own that space. That’s so important. For myself, I just became a homeowner and I wanted to explore the things that come along with that. The simple things like picking weeds in my front lawn. The painting is gigantic: a seven-foot by six-foot wide painting of myself picking weeds and sweating on the lawn as oak leaves from next door fall across the sky among sequined weeds. It still has the visual cue of the my other paintings as it still hosts that embedded sense of magic. My mother lingers in the work, as her eyes watch over me. Then there's the power line in the background that swings as you see a pair of Yeezy sneakers dangling from them. It presents a complicated image with a complex relationship to black culture in reference to someone like Kanye West and what it is to be black in America right now. Think of how expensive the shoes are: they're made in China, but Kanye commonly wears a “Make America Great Again” hat. He's such a complex individual and it’s a problem for black individuals to look up to him right now. The exhibition works with, and features, Warhol’s drag portraits. What would you say is the strongest connection between your work and Warhol’s? Devan Shimoyama: Warhol is someone you learn about in art school, but he has never been somebody that I looked to. I've definitely become more familiarised with his bodies of work that aren't as celebrated, such as his illustrations, his drawing on paper with pencil, the print of his cat with his mother's foot, or boys crying. They are so delicate. They talk about beauty and think about how advertising and beauty are in direct effect. The function of desire and beauty, and how they complicate one another, are themes definitely present in my work, especially when thinking of how the subjects in my work exist as individuals. I work with my subjects for a long time, and I create a new fantasy that celebrates bodies who are usually ignored. So I looked to some of Warhol’s other bodies of work that deal with darker themes or more obscure themes. Do you think there are direct parallels between your work and Warhol's Ladies and Gentlemen? 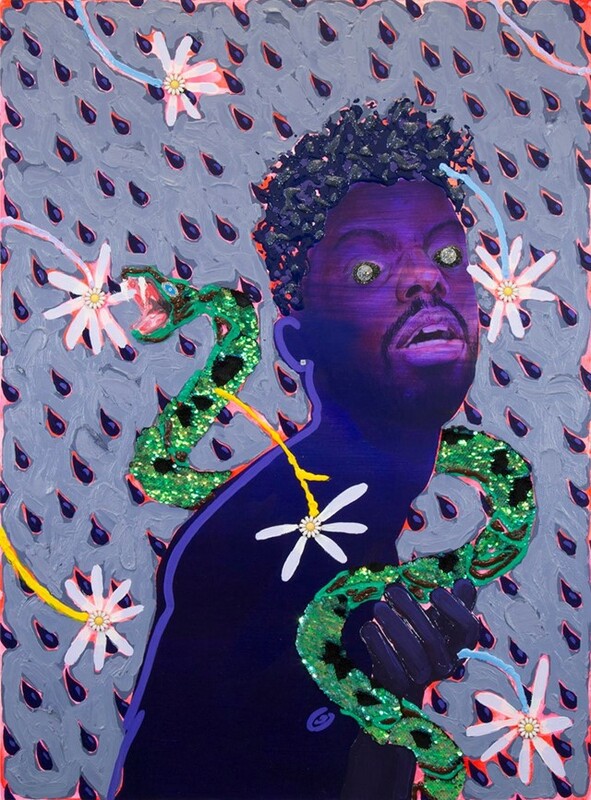 Devan Shimoyama: I wouldn’t say my entire body of work connects, but one of my more recent projects does, (in which) I’ve painted drag queens from Miami. I spent a month there this summer and connected with various drag queen people of colour that are cultivating the community down there. It was fascinating to learn about this group of young people of colour that are coming together to create a community and safe spaces for each other. There, drag is used as a healing tool. These queens go out in the night time and create this illusion of fantasy, and through that, they celebrate and support each other. It's really exciting to see. They also collect donations for LGBTQ individuals who can't access affordable housing. When looking to Warhol's Ladies and Gentlemen series, the individuals in his works were all scouted from this club environment too. Warhol was uplifting them, making them highly visible in a way, so I definitely think there's some sort of crossover in that. I'm really fascinated by these individuals and getting to know them and unpacking their identities. Which of his works do you think relate the most? Devan Shimoyama: Pieces like the Death and Disaster series, which talks about pain and beauty in a really nuanced way relate to my more sculptural works, which pay homage to those who have suffered from police brutality. Warhol’s series re-iterates and represents famous deaths. Images of death have been so heavily spread in mainstream media that it’s almost become normalised. Warhol beautified them to point to that issue. I saw footage on social media of a police officer shoot and kill a boy around the corner from where I was living in Pittsburgh. Coming from that point of trauma, those images have a different type of triggering effect, it's much more personal to me. Like Warhol, I use beauty to talk about these raw topics, but more as a coping mechanism and less so as a reiteration. I use a lot of visual language to pay homage to the victims of brutality. There are a few sculptural works in the show that use the tradition of urban memorials, so thinking of how in certain urban neighbourhoods they use DIY ephemera to commemorate a place where someone was killed.